Floyd-Steinberg Dithering is a method of dithering which tends to produce effective results with relatively few repeated pattern artifacts. 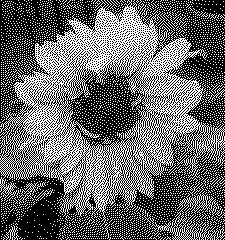 Floyd-Steinberg Dithering can be can be used for both black and white images, and for color images. The main disadvantage of Floyd-Steinberg is that it is relatively processor intensive, and therefore can be slow for the compuer to perform on large areas. Floyd-Steinberg Dithering can also be used when reducing the color depth of an image. For example, when converting True Color image into a color-safe palette image, Floyd-Steinberg Dithering can be used to avoid large smooth areas of color which would otherwise spoil the photographic effect of an image. A techical explanation of how this method of dithering works (with pictures).